My skincare routine involves cleanse, tone, serum, moisturise, double cleanse at night and a good night cream. Every few days, I use a mask. I know for some people this might be excessive, however, I use a different mask for different reasons such as a deep cleanse to clear my skin of toxins twice a week, one to hydrate if my skin is feeling dry and perhaps one to brighten and exfoliate if it’s feeling dull. For those of you who prefer a once or twice a week mask that will cleanse, exfoliate and brighten, I have found the perfect, inexpensive mask for you. 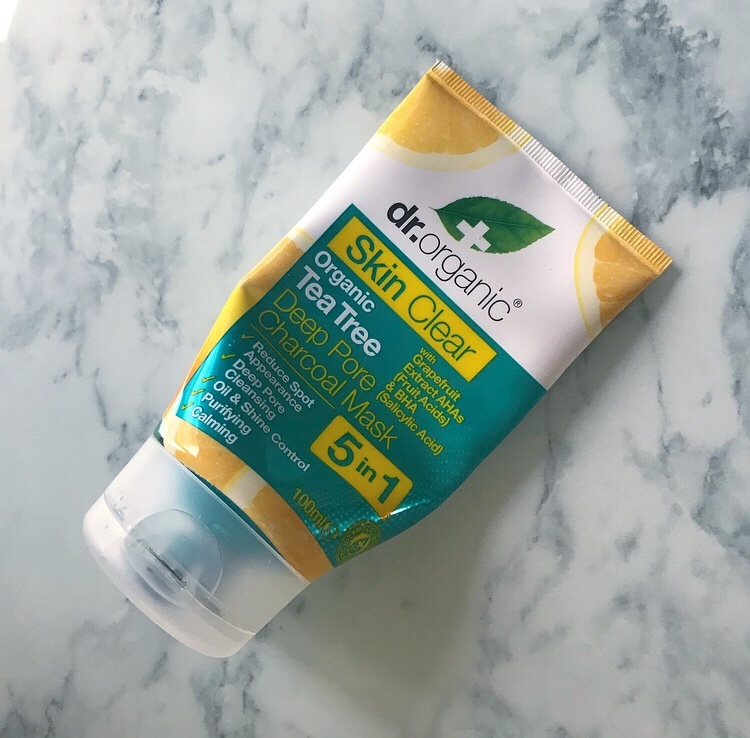 The Dr. Organic Skin Clear Organic Tea Tree Deep Pore Charcoal Mask is great to clean skin and pores, removes dead skin cells and exfoliates to reveal softer and brighter looking healthy skin. I would call it a Sunday night or Monday morning mask as it really wakes your skin up. The Organic Tea Tree Deep Pore Charcoal Mask is infused with Willow Bark Extract and Charcoal. It also contains blend of bioactive, natural and organic ingredients including Tea Tree Oil, Grapefruit, Chamomile Extract, natural AHAs (Fruit Acids) and Salicylic Acid which can help promote the rate of skin cell renewal. Skin will be left feeling smoother, purified and clearer – with visibly reduced pores. When I first got this I have to admit, I wasn’t super excited about it because I don’t really like Tea Tree. I put some on a piercing recently and I didn’t take to it very well and don’t really like the smell. Tea Tree is great for problem skin such as spots, blemishes and breakouts which I don’t really have, but if you do, you will love their full range.